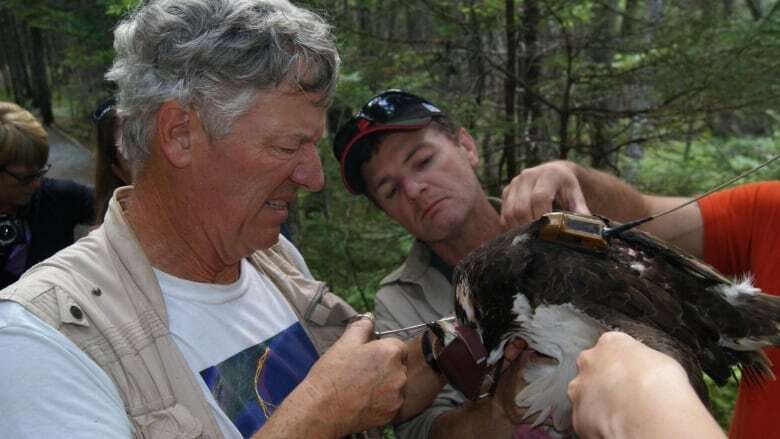 Ornithologist Rob Bierregaard is visiting Newfoundland to study ospreys. Rob Bierregaard describes an osprey like some people might refer to a movie star. "They're charismatic. They're dramatic. They're beautiful and, perhaps most importantly, they're really easy to study," Bierregaard told CBC Radio's On the Go. Bierregaard is an ornithologist — someone who studies birds — and is an expert in his field. He has been using satellite tracking devices to study migration since 2000. "So this my 17th year of doing it and just yesterday I tagged my 100th osprey, which was a pretty cool moment," he said. Most ospreys stand a foot-and-a-half tall and have a five-foot wingspan, Bierregaard said, adding the birds can be found all over the world. Bierregaard is visiting Newfoundland because of the province's position in the Atlantic Ocean. Most of his work on the bird has been done out of Martha's Vineyard, which juts out into the ocean the same way that Newfoundland does, Bierregaard said. "I was looking at the map of North America and I saw how far out in the ocean Newfoundland sticks and I said, 'Wow. If those young ospreys are doing what the Martha's Vineyard ospreys are doing, they're going to make a hell of a long crossing over the Atlantic, perhaps as much as 2,000 miles (3,200 kilometres), which might tie the record for long-distance over water flight by any bird of prey in the world,'" he said. "So this I thought was a great, exciting and dramatic way to wrap up my osprey tagging research." Bierregaard, a research associate of the Academy of Natural Sciences at Drexel University in Philadelphia, uses transmitters to track data. The transmitters are about five centimetres long and two centimetres high, and weigh about 24 grams. Though the transmitters are small, they are effective at recording three days worth of data. By tagging the ospreys with these transmitters, Bierregaard learns how high the birds are, what direction they're flying, how fast they're flying and where they are located. "So we're learning about how the young birds integrate into the breeding population, which is one part of the osprey's life story that is a complete mystery," he said. Bierregaard said the transmitters don't seem to bother the birds, as they are able to fly efficiently over long distances. "No one has tagged the birds this far east," he said. "The farthest east any bird has been tagged is Maine, and they just go down the coast. They don't have that situation that these birds [in Newfoundland] are going to have." "Ospreys are a highly specialized bird of prey," Bierregaard said, adding they hunt during the day, as opposed to night, and are related to hawks and eagles. They also only eat fish, which Bierregaard said "makes them very strange" as they're the only bird of prey with such a restricted diet. 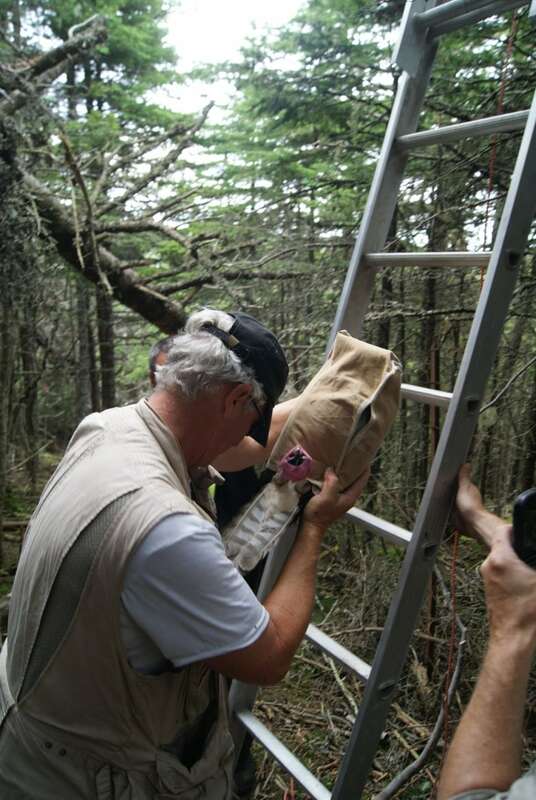 In order to get the transmitters on the birds, Bierregaard tempts them with trout placed in traps securely placed on trees. "We caught a female yesterday that was one of the biggest I've ever caught," he said. "She weighed almost 2.2 kilos, that's about 4.6 pounds. That's a lot of bird." Bierregaard has a website and an app where anyone can track the ospreys he has tagged. He also chronicles his adventures on Twitter and Facebook.